Halloween is over, so our joke notes are pushed to the wayside. Our wordless riddles are taking a break, and the troops are ready for someserious lunchtime fun before the holidays hit. put a pencil in the bag! YES! notes where we find hidden things! oh YEAH! like in Highlights and High Five! 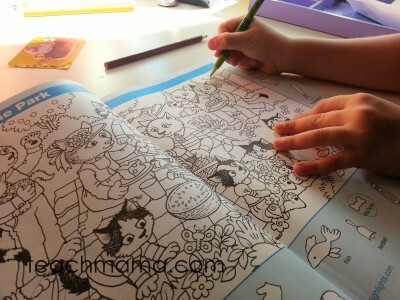 Lucky for us, I had just spent a great deal of time with my friends over at Highlights and High Five this month, so I got the ‘go-ahead’ to create just that–Hidden Pictures® Lunchbox Notes for my three favorite people in the whole wide world. These lunchbox love notes totally rock the house. They make me–and the kids–really, really happy. 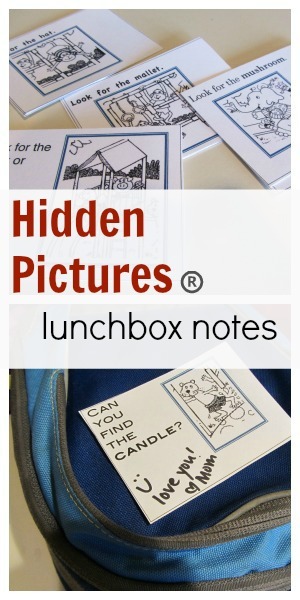 Hidden Pictures– Lunchbox Notes: I think, for us, our Hidden Pictures® Lunchbox Notes takes the lunchtime love to a whole new level. 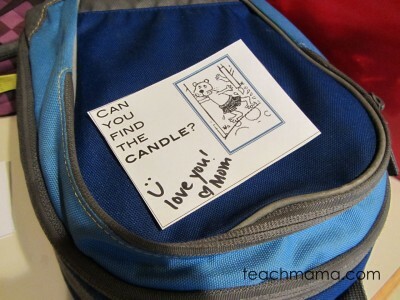 These lunchbox love notes stemmed from my kids’ love of . . . Hidden Pictures®! These guys are simple but fun. And yes, I’m a sucker for a good ole lunchbox note, so maybe I’m a bit biased. But I think taking something my kids enjoy and turning it into a little lunchtime hug is . . . well, satisfying. Maybe it gives them a tiny bit of quiet time they have to themselves as they unpack their food. Maybe it’s a conversation starter with a pal at the lunch table. Maybe it’s ignored or thrown to the bottom of the bag. From the magazine. . .
. . . to the lunchbox. Love it. But I feel better just knowing it’s there. Just in case Maddy, Owen, or Cora is having a tough day and they need a reminder that they’re loved and that their mama’s thinking about them. 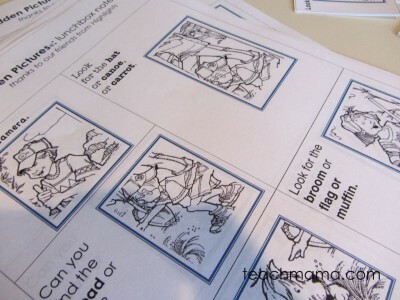 So Hidden Pictures® Lunchbox Notes it was–and is–for my kiddos for the next few weeks. Look for the . . .
Can you see the. . . Though she might not be able to read the words that identify the objects she needs to find, I did put the word in bold so that if she couldn’t read the word, she could at least search the picture for a hidden object and then go back to the word to try to figure it out. And I also know that Owen’s in her lunch period and he usually sits across the aisle from her, so he can always read it if need be. And knowing the two of them, he very well may read them to her every other day. I created three pages of notes with 5-6 messages on each page. Each note has a wee bit of space on the side so I could write a short little message. And that’s it–just a quick little note for lunchboxes–or any time. Maybe they’d even work thrown in your purse or diaperbag for those unplanned waits in the car pickup line, doctor’s office, or grocery store checkout. Either way, Happy hidden picture-hunting! 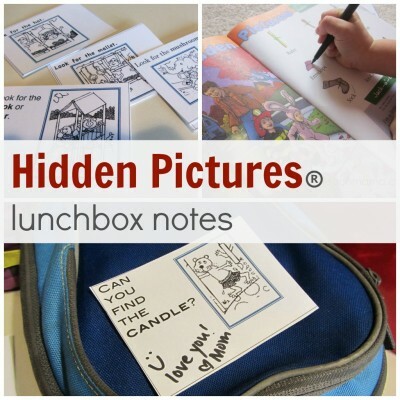 fyi: Huge and happy thanks to my friends at Highlights for permission to use pieces of their Hidden Pictures® puzzles in our lunchbox love notes. These puzzles actually came from a Hidden Pictures® Magazine–the entire thing filled with the pictures we love! Take $5 Off a 1 Year Highlights for Children Subscription! If you want the real-deal Hidden Pictures® (which I’m sure you do!) be sure to visit the Highlights website, where you can grab your favorite kiddo a subscription to the Highlights Magazine, High Five Magazine, or any of their other fab, just-for-kids periodicals, including the Hidden Pictures® ones! I pinned this to my A+ parent information board! 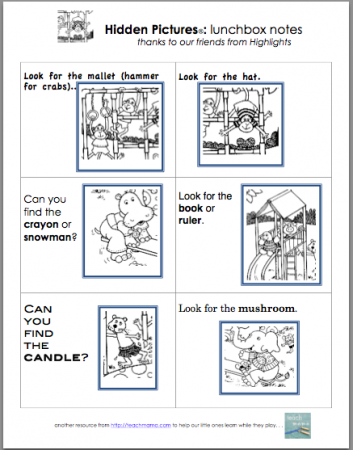 I have used the HIGHLIGHTS hidden pictures printables in class with first graders, one of the few times during the year when children worked in their own and I could take 5 to prepare the next class or help a child. The pages print from the HIGHLIGHTS website. 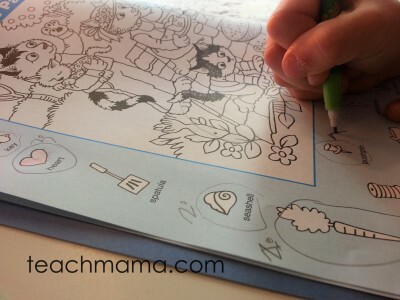 Children love hidden pictures and finding notes in lunch boxes. Great ideas! thank you thank you thank you Carolyn!! I loved Hidden Pictures from Highlights magazine when I was a kid. I only got to read it at the dentist’s office so it was a treat! What fun for lunch box notes! I can barely get the lunches packed in the morning while rushing the kids to school. 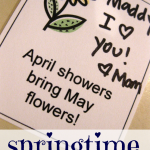 What a great idea for more organized moms than I am! THANK YOU SO MUCH! My kindergartener wants a not every day and I was so tired of making them. Used the batch from back to school but I guess I missed the Halloween jokes.